Bruderheim, Alberta, Canada. This one fell on March 4, 1960. It's a stone, L6 chondrite with black fusion crust. This 1.1 kg mass was found shortly after the witnessed Fall. Not surprisingly, meteoritics is the science or study of meteorites -- "meteorology" was already taken. While it may seem like an obscure, highly specific science, it is, in reality, a multidisciplinary science requiring a broad base of knowledge. The serious meteoriticist must have a working knowledge of astronomy, astrophysics, geology, mineralogy, petrology, chemistry, metallurgy and even biology. Through the study of meteorites scientist have an opportunity to study the conditions that existed during and immediately following the formation of our solar system, and the planetology of asteroids, the Moon and the planet Mars. To these scientists, and a growing number of collectors, meteorites represent Nature's ultimate sample return mission. How we got to where we are is quite a story. 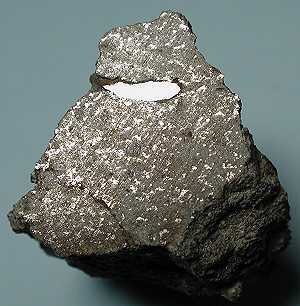 Foum Zguid, Morocco, coarsest octahedrite IIB. Meteorites have been used and worshipped by various societies for thousands of years. The Willamette octahedrite of Oregon, U.S.A., the Campo del Cielo octahedrite of Argentina and the Cape York octahedrites of western Greenland were worked by indigenous natives as a source of iron for tools and jewelry for hundreds, if not thousands, of years before being discovered by Europeans. The Phrygian stone, witnessed to fall in 2000 BC, was worshipped by ancient Romans for hundreds of years and meteorites have been found in Egyptian tombs. Many early cultures recognized certain stones as having fallen from the sky whether as a result of an oral history of the fall or as an attempt to reconcile the unusual nature of a rock of pure metal. But to the scientists of the Renaissance and later periods, stones falling from the heavens were considered superstition at best, heresy at worst. The tangible legacy of meteoritics in the western world can be traced back more than 500 years to the memorable year of 1492. On a bright morning in early November of that year a stone chondrite weighing almost 130 kilograms abruptly ended a multimillion year journey by hitting the Earth near the town of Ensisheim, Alsace, France, then in the hands of Germany. The fall was well observed and a woodcut was made of the event, but the only official notice was political in nature. King Maximillian of Germany just happened to be passing through a few weeks later and used the opportunity to declare the meteorite to be a sign of God's anger towards the French for warring with the Holy Roman Empire. The remaining 55kg mass of the meteorite is on display at the Ensisheim town hall. 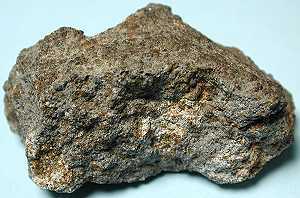 The earliest observed fall of a meteorite from which material still exists is the Nogata, Japan L-chondrite that fell in A.D. 861. The next few hundred years were marked by the gradual advance of scientific methodology and continuing reports of stones falling from the sky. Finally, in the late 18th century and early 19th century the two paths converged. The 1790s and early 1800s experienced and unusual number of witnessed meteorite falls. In 1794 Ernst Friedrich Chladni (klad' nee), considered the father of meteoritics, published a book in which he concluded that stone and iron masses did fall out of the sky and were associated with high speed fireballs. Because of the hundreds of eyewitness reports that were coming in, many scientists were beginning to accept these conclusions. In his book, however, Chladni took the next great leap and concluded these objects could only come from space. For this he was immediately ridiculed, then ignored. Historic Fall - L'Aigle, France, L6 stone meteorite. 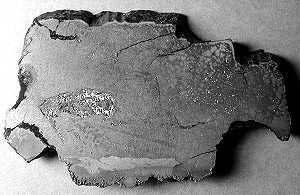 Finally, on April 26, 1803, thousands of L-chondrite fragments bombarded L'Aigle in Normandy, France, an event investigated by Jean-Baptiste Biot of the French Academy of Science. Until that time the Academy had been one of the staunchest holdouts against acceptance of Chladni's theory, but after Biot's analysis they, too, had to accept rocks falling from space. 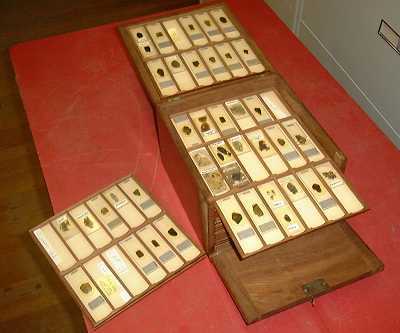 Historic thin-section collection dating back to the mid-1800's. More than 100 meteorite localities are represented in this thin-section collection curated at Harvard University. In the early 1800s news traveled relatively slowly. People did not get frustrated waiting 15 seconds for a page to load from 3,000 miles away. New information could take months or years to be collected, analyzed, published and distributed. In the cold chill of a December morning in 1807, Judge Wheeler walked from his home in Weston, Connecticut, USA, and was surprised to see a ball of fire moving across the northern horizon. He watched as it passed to a point almost overhead where it flashed several times and disappeared. A few moments later he heard a great noise. Thunderous and roaring, the noise grew to a frightening level. He then heard the whizzing sound of something falling. As the judge looked up, he observed a small stone strike a nearby building, bounce off, and roll onto the grass. The judge decided to contact nearby Yale University and ask that the event be investigated. Two very skeptical professors came out to look into the matter, fully prepared to dispel the story of stones falling from the sky. The two professors conducted a lengthy investigation. They knew these stones were different from any they had ever seen and they witnessed local townspeople extracting them from holes in yards and nearby fields. Finally, the two wise professors from Yale concluded the stones must have fallen from the sky. Thomas Jefferson, President of the United states, responded with great skepticism: "Gentlemen, I would rather believe that two Yankee professors would lie than believe that stones fall from heaven." Whether Jefferson's quote is truth or myth, his belief real or an opportunity for a witty Virginian to take a shot at a two Yankees, is not known and not really that important. What is important is that the story reflects the mindset of a scientific community struggling to reconcile observation with entrenched belief. 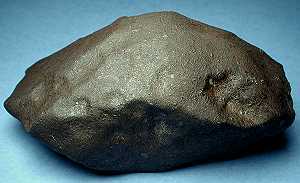 Meteoritics has made significant progress in the past two hundred years, particularly in the past 50. (as late as the early 1940's scientists were still debating whether geologic formations on the Earth, such as Meteor Crater in Arizona, U.S.A., were volcanic or impact in origin.) We are learning more about what meteorites are and what they are made of. They have been broken down into dozens of classifications, their elemental components determined, and, in some cases, asteroidal and planetary origins determined. But for all the information about what meteorites are and ongoing studies to determine more and more detail, their formative process is still poorly understood. 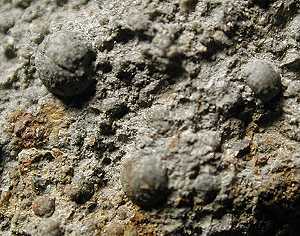 For example,Chondrules, a component of the majority of stone meteorites, are a particular mystery: How did these tiny glass-melt spheres form before being incorporated into the masses of chondritic bodies? When, in the solar nebula, did they form? What energies where required and what was the source? We've learned a lot but our understanding of meteorites is still unsettled requiring ongoing analysis, observation and thought.